CULVER CITY, Calif. (July 14, 2017) – “Out of the darkness and into light, comes your Horrorscope on this dark and stormy night.” Director Robert “Freddy Krueger” Englund dials up a gothic tale of high-tech horror in 976-EVIL, debuting on Blu-ray™ for the first time October 3 from Sony Pictures Home Entertainment. 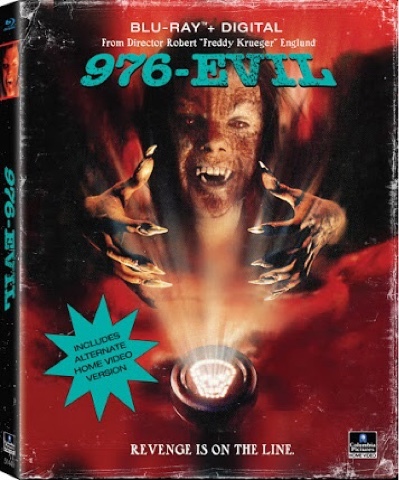 Presented in its original aspect ratio and remastered for high definition, 976-EVIL includes an all-new commentary track for the film by Robert Englund, along with his wife, Nancy Booth Englund, who was the set decorator on the film. In addition, bonus materials on the release include an alternate home video version of the film featuring 12 extra minutes of footage. Starring Stephen Geoffreys (Fright Night), Jim Metzler (L.A. Confidential), Pat O'Bryan (No Holds Barred) and Academy Award® winner Sandy Dennis (Best Supporting Actress, Who's Afraid of Virginia Woolf?, 1966), 976-EVIL is the number to dial to receive supernatural powers and turn into satanic killers. Hoax (Geoffreys) uses the powers the number gives him to exact revenge against everyone who has wronged him, inadvertently allowing his soul to be slowly taken over by Satan.